Sawyer Brockstedt, 10, of Rehoboth Beach, is playing well on the junior tour circuit this summer. Sawyer Brockstedt would love to go to Augusta National next spring and compete in the national Drive Chip and Putt championships. 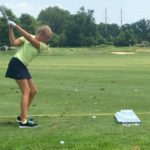 The 10-year-old Rehoboth Beach resident completed her first step toward that goal, easily winning the local qualifier at the White Clay Creek Course in Wilmington July 19. Brockstedt took first places in chipping and driving, and a second place in putting. 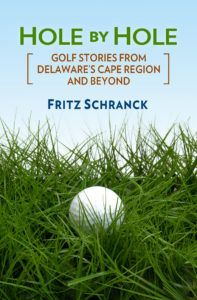 Her next round takes place August 8 at Applebrook Golf Club in Malvern, PA.
Brockstedt’s fine play this summer continued at the July 23 Eastern Shore Junior Tour competition at Bear Trap Dunes. She won first place in the 13-and-under division with an even-par performance, which earned her a playoff spot. She then won in the second hole of sudden death. I have not yet used a tourniquet on a golf course. However, the first aid kit in my golf bag has been handy. Medzone sells handy-sized packages of several treatments for athletes. Perhaps that’s why I was drawn to the potential benefits of the MedZone Activity Pak. At the 2017 PGA Merchandise Show I met Joe Freeman, the President and CEO, an enthusiastic promoter of the company he bought a year ago. MedZone, in business since 2001, has a strong following among athletic trainers in college football, fitness centers, and other sports medicine-related businesses. There are four basic products. PainZone is a topical balm for strains, sprains, and arthritis pain, spread with a roller ball. BlisterZone is a skin protectant for chapped, chafed, or cracked skin. BurnZone is a lidocaine-based pain-relieving ointment for sunburn, insect bites, and minor cuts and scrapes. ChafeZone spreads on the skin like a stick deodorant. It is used before the activity, such as in the sports bra or groin area, to provide a barrier against repetitive friction or rubbing. What’s unique about these products is how they are packaged for golfers and other travelers. The Activity Pak puts all four items in a little box, roughly 5” wide by 3” high by 1½” thick. The box fits easily in a golf bag pocket, either together or with the items stored separately. They are also a great size for a carry-on bag. Freeman said providing better different forms of sizing and packaging for the MedZone products has been his major emphasis since he took over the company. The first requirement for the Boy Scout’s Golf Merit Badge is to show you know your first aid for injuries that can occur while golfing. The MedZone Activity Pak does much the same thing for the rest of us, and in a convenient package. Speaking of matters medical, the beastly hot weather in the Cape Region calls for repeating past advice about heat exhaustion and heat stroke. Heat exhaustion can be caused by exercise in a hot and humid environment. In high humidity, your body can’t rely upon sweating to cool the body. If you don’t replace the fluids your body sweats out, however, you can experience shock-like symptoms. Heat stroke is more dangerous. It can come on quite rapidly, often affecting the elderly and the very young. For others, heat stroke can also occur with exertion in a hot environment. Heat exhaustion symptoms include cold, clammy skin, muscle cramps, dizziness, and profuse sweating. Heat stroke, on the other hand, may not produce much sweating, but it can create disorientation, hyperventilation, and the skin will feel dry to the touch. Golfers should call the pro shop as soon as possible if their golfing partners show signs of succumbing to either of these conditions. While waiting for help in cases of heat exhaustion, try to have the person rest in a shaded area, drink cool non-alcoholic fluids, and loosen their clothing. For heat stroke, medical authorities suggest moving the person to a cool environment, while fanning them to cool their skin. Drink offers should only be made if the victim appears to be mentally alert. The Kings Creek Ladies 9-Hole group played a team Shamble game July 19. In this format, each person hits a tee shot, and the team selects the best drive. Each golfer plays stroke play from that point. The two best scores on each hole count toward the total. Jeanne Drake, Linda Miniscalco, Sandy Neverett, won first place, with Mary Beth Merolla, Janie O’Connor, and Bernie Reid in second. Gail Petren, Annette Stellhord, and Jeanne Drake (blind draw) took third. The Sussex Pines Ladies played a Criers Tournament July 18. Brenda Lewes won first place gross, with Rhetta Rose Frampton in second and JoAnn Foster in third. Debbie Quinn won first place net, with Kathy Hudak in second and Susan Shockley in third. Sussex Pines also hosted a WPGA Tournament June 27. Donna Tanguay, Karen Serginson, Danette Travaglini, and Maureen Gallagher of Bear Trap Dunes won first place gross. JoAnn Foster, Kathy Hudak, Brenda Lewes, and Linda Townsend of Sussex Pines won first place net.